b Go towards the extreme with this rugged cruiser! /b With genuine 4wheel suspension, this Extreme Cruiser can handle the roughest terrain. Open the doors and trunk! Pop the hood and check out the working pistons because the cruiser moves! * Watch the pistons actually move! * Rooftop steering enables you to drive smoothly over rough terrain * Suspension system on all 4 wheels gives this Extreme Cruiser a sturdy ride * Open the hood, doors and trunk! 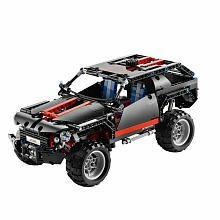 Rebuild into a custom offroad car! 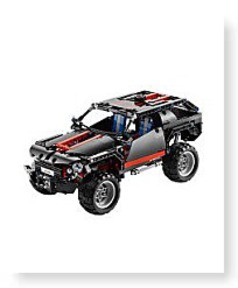 * Rebuild into a custom offroad vehicle Maneuver more than hill and vale with the rooftop steering! Dimensions: Height: 11" Length: 19" Width: 3"
Package: Height: 3" Length: 18.5" Depth: 10.9"